Dennis Tomasik (pictured above) was convicted of first degree criminal sexual conduct after trial in Kent County and was sentenced to a lengthy prison term. The Tieber Law Office fought the case in the state courts on direct appeal for many years, concluding with a full grant of leave to appeal by the Michigan Supreme Court. 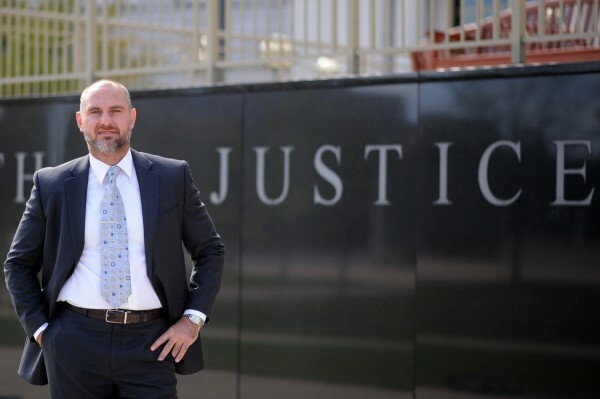 Kris Tieber briefed and argued the case in the Michigan Supreme Court and that court reversed our client’s conviction and ordered a new trial. The Tieber Law Office worked seamlessly with Chartier & Nyamfukudza PLC, and after a second trial where the evidence uncovered by the Tieber Law Office was presented to the jury, a not guilty verdict was rendered in minutes. In 2017 Mr. Tomasik was placed on the national registry of exonerations. Marty was awarded the 2017 Unsung Hero Award by the Michigan State Bar for work on this case. Click for more information on the award. ​​When complex DNA evidence was used to convict our client of second and third degree criminal sexual conduct in Emmet County, the Tieber Law Office thoroughly examined the science behind the conviction. After a lengthy hearing we were able to prove that the trial defense counsel had neglected to show the jury that the main prosecution DNA evidence actually was favorable to our client. The trial judge granted a new trial and our client was later released. The Tieber Law Office was granted an evidentiary hearing in federal district court after a state court conviction for sexually abusive activity for which our client was sentenced to 7-40 years in prison. After hearing several witnesses, the federal district court judge issued a writ of habeas corpus from the bench, requiring the state to grant a new trial or release our client within 120 days. The Tieber Law Office was retained to seek an earlier parole date for our client, who was given a lengthy term of years in 1993. After filing a motion and brief, and after arguing the matter, in the Livingston County Circuit Court, requesting that the trial judge grant permission for earlier parole consideration in a habitual case, the Tieber Law Office was granted an order permitting the parole board to consider the client's release 3 ½ years earlier than scheduled. The client was released from prison. After the Tieber Law Office filed a petition for writ of habeas corpus and brief in support, a federal magistrate judge recommended the grant of the writ, and the federal district court agreed and ordered release or a new trial. The state attorney general appealed to the United States Court of Appeals for the Sixth Circuit. The Tieber Law office filed a responsive brief in the Sixth Circuit and argued the case in Cincinnati. The Sixth Circuit issued a full opinion affirming the grant of the writ of habeas corpus by the federal district court and demanding that the state retry our client, or release him, within 120 days. Our client was convicted of criminal sexual conduct in the first degree, kidnapping, and assault. After he lost his direct appeal through attorney neglect, the Tieber Law Office was retained and filed a multi-issue Motion for Relief from Judgment, with an extensive brief in support, under MCR 6.500, arguing, among other issues, that our client's direct appeal rights should be restored due to ineffective assistance of appellate counsel years earlier. The trial court agreed, and our client's appeal rights were restored, allowing him to file a timely application for leave to appeal his original guilty plea conviction, thus restoring his ability to file a federal habeas petition. Convicted of burning his own home and sentenced to up to 20 years in prison, our client had his conviction reversed twice due to hard work over several years by the Tieber Law Office. At trial, the prosecution fought tooth and nail to deny our client an appointed electrical engineer, despite the fact that they brought in an electrical engineer supplied by the insurance company in this lengthy and complex arson trial. On appeal, with the assistance of a highly qualified electrical engineer who agreed to work without pay, we were able to prove that the fire was caused by an electrical short. The Court of Appeals, in reversing the conviction, did not even get to that issue, instead reversing on the fact that the trial court abused its discretion in admitting evidence of various prior fires "associated with" our client, another issue developed on appeal. The Michigan Supreme Court later reversed the court of appeals in a 4-3 decision, but the Tieber Law Office did not back down, and later won the case a second time in the Michigan Court of Appeals, this time because the trial court refused to appoint an electrical engineer at our client’s trial. Our client has been released from prison. Our client was convicted of second degree CSC, and received a sentence of 3-15 years. After reviewing the case, the Tieber Law Office filed a successful multi-issue Motion for Relief from Judgment under MCR 6.500 with supporting brief. Our client's conviction was vacated and he was released from jail. In this second-degree murder case, our client was convicted after a lengthy bench trial and sentenced to 17-30 years imprisonment. The Tieber Law Office was retained, and after conducting an evidentiary hearing on complex medical and scientific evidence, we were able to persuade the trial court to reverse the conviction on the basis that there was a medical answer to the testimony of a large number of doctors presented at trial by the prosecution. The reversal of our client’s conviction was affirmed by the Michigan Court of Appeals and the Michigan Supreme Court, and our client was later released.